Here we are discussing the applications of genomic (or genetic) information on cattle in Africa, both in the near future (next 5 years) and longer term. (2) Which genomic or genetic applications have the most potential to positively impact on the rural poor in Africa – in the near future and the longer term. Please submit your contributions on these by posting below. Use the comment box (scroll down) to add a new comment, or reply to existing comments using the reply button. I will just join those who believe that we first have to ensure phenomics in Africa before moving forward to genomics.How is it possible to have for example the breeding values of our cattle breeds when there is no recording of their performances?We have to convince farmers that it is very important to keep consistent records on the performances of their animals.Of course prior to that phenotypic identification of our breeds is a must.On my own point of view we need to first focus on this. Dear all. Sorry for delay. Here in Sudan we have some animals are indangered. I search in one of them (nubian ibex) I would like to study the genetic diversity/population structure and assess the gene intoregression between ibex and do mastic goats in red sea state in Sudan. i would like to do share the samples of DNA with most countries where ibex is exist. One challenges with phenomics (as applied in functional genomics) is not phenomics itself. Its much more to do with how we train the next generation of scientists. Correct me if I am wrong but I see a lot of lack of connectedness in the way most courses are taught. Take an example of biochemistry, mathematics, biology and animal science (including animal breeding, animal health and animal nutrition). Until when the teaching/learning shows serious connections, the application of the omics in our production systems will only look good on paper but not on the ground where the animals are. Thanks MIzeck and I fully agree - integration across disciplines is essential! The current state of livestock production in Africa is pathetic despite the huge potential of these animals to sustain the livelihoods of farmers. If phenomics and genomics could help improve livestock production and productivity, then African countries should not put these at the back burner. We should move away from our current crude ways of doing things by exploiting modern technologies that will contribute to increased livestock populations and more income to the farmers. Although the task is daunting, I believe if all the relevant stakeholders (governments, research institutions, farmers, regional and sub-regional organizations, private investors, NGOs and funding bodies) are highly committed and give phenomics and genomics the much deserved priority, then we will overcome. All current efforts geared towards improving African livestock especially cattle should be harmonized to yield laudable results. However, we should not forget the aspect of capacity building as it affects researchers and farmers. On a final note, I wish to commend the organizers of this e-discussion for a job well executed. Please keep the good work up. In agreement with most contributors (especially Dr. Okeno Otieno & Dr. V.E. Olori), phenomics is a bigger challenge in African livestock system. Efforts should be channeled more towards establishing phenomics and well defined conventional breeding schemes. No doubt genomics is great as it facilitates rapid genetic improvement, but this is not possible without phenotypes. Even in developed countries where genomics is currently implemented, there is still emphasis on the collection of more and more phenotypes. That goes to show how important phenotypes are. As Prof. Mike Coffey of University of Edinburgh rightly puts it "In the era of genomics, phenotype is king". So, be it for genome-wide association studies which enables us to link phenotypes to genes or genomic selection which could lead to rapid genetic improvement in African livestock system, phenomics is paramount. I wanted to share research in Ethiopia on estimation of breed composition level using Ancestory Informative MArkers (AIMs). Recent results showed few AIMs (~ 50 SNPs) accurately estimated the Awassi level in the Awassi x local crossbred population in the highlands of Ethiopia. We used this information to reccomened different level of Awassi introgression for different areas after associating the genomic information with the performances of the sheep. Once the AIM SNP pannel developed, cost to estimate the breed composition of an animal is cheap (price to genotype a SNP is in the range of 3 to 10 euro cents). I guess this would be highly attractive and applicable in developing countries especially in dairy sector. For example in Ethiopia, due to poor or absence of recording and indiscriminate crossbreeding level of introgression of Holestein in to local Zebu breed is uknown. farmers and investors engaged in dairy business are highly curios to know the breed comopsition of the animal the are using. In addition, knowing the level of breed composition is mandatory to implement well structured crossbreeding. Ethiopian Biodiversity Institute has developed a proposal to use this tool to quantify the level of admixture of exotic blood in the dairy cattle population. The use of high density marker for breed characterization and for detection of selection signature might also be another area of interest. So my suggestion is to to strengethen and start use genomic tools for breed composition, deversity studies and detection of selection signature. At the same time establishing national pedigree and performance recording is crucial. These will lead us to use genomic tools for genomic selection and association studies. Thanks - and this aligns with some of the earlier contributions on current and potential use of genomics. In particular, one of the most commonly discussed applications was around determination of breed composition. Phenomics is actually a challenge in African Livestock breeding system. However, it would be better to associate the phenomics to the genomics rather than trying to sort out first the Phenomics issue. There is lack of genetic associative study in African indigenous livestock and this is unfortunate for development of a sustainable breeding programme. Hi all - looking forward to more contributions moving into the last day of the forum (tomorrow - Friday 26th August). And also please don't forget the survey (accessed by the 'take survey' tab above). Dear All, I have been late to join this discussion mainly because am in an area where the network connections are not good, it has been very interesting, i took time yesterday and today to go through almost all the discussions and i commend Karren for initiating such a forum. Phenomics as it is now is a real challenge, however i would want to suggest that African governments be put to a challenge to develop livestock policies that will incorporate tracability and record keeping for all livestock, this is not easy in countries where the level of illiteracy is high, but such programs adult literacy can be incorporated in the extension programs for livestock farmers. we developedd a recording method with rural farmers while disseminating elite bulls from ITC for multiplication by farmers, the farmers were using their family members who are going to school to do the recordings, I think if such programs are introduced to farmers they will notice the importance of animal record keping. I believe phenomics is a big challenge and genomics without first sorting out the phenomics issue will be a bigger challenge. Recording phenotypic data is a challenge because there is no concerted effort towards improvement of any trait hence need for recording the trait. Where such interest exist, then the challenge is a structure that will allow the highly dispersed farmers to be enrolled in a recording scheme. First you need to convince the farmers why such regular data collection is important or beneficial to them. Then you talk about the cost, methodology, personel and tools of doing the actual recording. So the challenge, as I see it, is the of absence an organisational structure resulting from a motivation to bring about change. If we can set up the institutions to facilitate this, African farmers will be open to data recording which will kick start the livestock improvement process. Genomics can then follow naturally. We need an institution or institutions to champion change and manage the whole process of livestock improvement at national and perhaps regional levels in Africa. Thanks Olori for your insights. We had some earlier discussion on incentives for farmer data recording - do you have any additional suggestions here? 2. Let us educate our farmers to keep records and tell them the importance of records in day to day management of the farms. This means that the farmers needs come first and not the breeder as it is today. Currently most of the dairy cattle are in the hands of smallholder farmers but most of them do not keep records. Even some large scale farms only keep records for few traits. Capacity building is therefore, needed in this area before implementation of genomic selection. If we carry out the above two then implementation of GS will be very easy. We should always remember GS cannot work in isolation, bu, it provides additional information to conventional breeding to help us accurately estimate breeding values. So even if we genotype all the animals in Africa today, but we do not have phenotypes, it is all work in futility. As things stand now, donors will come, give money for hazardous implementation of GS, just as they did with crossbreeding. When the projects end, researchers shall have benefited by publishing papers, making money, donors shall have added something to their CV, but there will be nothing to show for the time and resources used and the cycle continues. My appeal is that let us do basic things first. The fact that GS is doing well in the developed countries is an indication that it can do well in Africa. But we must seek to understand the underlying factors behind its success. If we cannot and just rush because it worked somewhere else then we will be wasting time as always. Africans are very good in embracing and consuming ideas without deep understanding. This could explain why sustainable genetic improvement of livestock in Africa has not been realized. This by extension has turned Africa to be a major importer of livestock products, yet we have sufficient resources and technologies for local production. We must be wear that some of the people pushing for these technologies know very well what is needed for them to work but they are not talking about them. Some (multinational, research organizations and researchers push them for economic reasons. We must be rational. Genotyping is not cheap. One of the recommended genotyping strategies is use of priori-information to make decisions on which candidates to genotype. How will such decisions be made without phenotypes? The size of the reference population also have an effect on the accuracy of selection. Reference population must have candidates which are both phenotyped and genotyped? Without or with limited and unreliable phenotyping as it stands now in Africa, what kind of progress do we expect and will it be economically viable? We should make decisions based on proved scientific facts in African production conditions. Can we organize our breeding programs and promote phenomics first and then adopt GS? Since most of the animals are in the hands of smallholder farmers, there is need for educating farmers on the need of recording. The narrative should be changed, so that the farmer and not the breeder becomes the focal point in records utilization. Currently, most farmers feel the records are for breeders. However, records are critical in making critical decisions in the farm and breeders are just end users to provide the farmer with additional information to make decisions. Livestock production should perceived as a business venture/enterprise by farmers. Farmers should therefore be informed of the needs of records to asses the economic progress of their farms. Processing companies my also help to enforce traceability of products. This would be only feasible with reliable records at farm level. Thanks Okeno - your comments align with what many others have contributed to the forum. Great to see a general consensus. Establishing Animal genetic resources programs including identification, recording and genetic evaluation and dissemination of adapted genes is an important step for Africa. This is the plus of phenomics. I am therefore currently working with a wide group of researchers (from the USA, Canada, UK, South Africa, Brazil & Australia not in any order of importance!) to develop a funding proposal specifically focused on alternative approaches to cost-effectively and practically measuring resistance/tolerance of cattle to both cattle and multi-host tick species, with the aim of approaching several funding agencies to co-invest in a new project that would evaluate several alternative methods and comparing the alternative approaches to the current but infeasible 'gold standard' of tick counts. We have the potential use of two well-equipped research stations and relevant cattle herds + experienced field technicians and research station managers (one each in South Africa and Brazil, with the possibilities of undertaking artificial tick infestations or using natural infestations if that is a preferred experimental approach) and an offer by one of the world's leading genomic statisticians to design the experimental populations with the aim of using the results in nucleus cattle populations that have been and are continuing to be established with the specific purpose of improving all traits in the relevant breeding objective using genomic selection approaches. The primary aim of the proposed research will aim to deliver benefits to Africa, South America and Australia, with spin-off benefits to other countries also impacted by ticks and tick-borne diseases (latest estimates being that ~80% of the world’s cattle are at risk from ticks & tick-borne diseases with losses estimated to be of the order of US$20-30 billion p.a.). Our thinking is that development of a 'model' proposal based on a co-investment approach for tick resistance in beef (and dairy) cattle might serve as the basis of a similar funding model for use in developing new phenotypes for other (particularly adaptive) traits in cattle and other grazing and intensively reared livestock. As well, the new technologies being trialed to assess tick resistance in cattle might also have value for use in testing other traits in cattle and other livestock species. Thanks Heather - this is an extremely exciting initiative! Certainly, we cannot talk about genomics in isolation. According to a recent report, the demand for high throughput phenotyping may stimulate a migration from conventional laboratory to web-based assessment of performance and behaviour, and this offers the promise of dynamic phenotyping-the iterative refinement of phenotype assays based on prior genotype-phenotype associations. In this wise, we may have to generate the phenotypes from animals which may vary from one country to another. Such phenotypes, although may take some years to generate when standardized Ab initio will be more tenable than relying on specific information without enough validation. We may borrow a leaf from the current ACGG project being led by ILRI, Ethiopia where provision is made for both phenotyping and genotyping of chicken being tested. Also, we may align with the regional initiatives of AU-IBAR on the characterization and improvement of African Livestock. It is only when we have a common goal and pull resources together that we can make a reasonable progress. Really appreciate the forum even though my contribution wasn't much due to bad network in the area I'm living. In a nut shel we need an innovation platform for the African cattle and the issue of gene transfer should not be in place our animals has the potentials to do what ever we want and can be achieved through genomic selection as discussed previously. Welcome to week two of this forum - thank-you very much to those who have participated to date, and I look forward to more challenging discussion. Many people have commented on the need for phenotype information on African livestock - both in its own right and in support of genomic applications (such as genomic assisted prediction of breeding values). In relation to this, I would like to propose the next discussion topic as "Is phenomics - the ability to measure livestock performance - a bigger challenge than genomics in African livestock systems and, if so, how can we increase phenomic capabilities"
Phenomics is certainly a bigger challenge and I don't think it is limited to only the African Livestock systems although it could be much more challenging than others. Although Phenomics presents greater opportunity for livestock improvement however addressing the genomics capabilities first will be a good rung to start. Its difficult learning to run when we haven't started crawling. It will be interesting to identify with precision any Genomics success story or positive Genomic actions in Africa and find out who are the pioneers (local scientists vs Hired Experts), (National funding vs Outside funding...projects...) and check their sustainability and impact on real farmers income. As pointed out by Karen in of her recent messages, there are many opportunities that genomic applications could afford the African livestock sector. Meanwhile, the key question for me is: how do we tackle the issue of animal recording and identification in the commonly practiced traditional livestock farming system of this continent? In as much as the extensive system still prevails in many African societies, maximizing the potentials of genomic or genetic applications is doubtful especially in the nearest future term. Thanks Olawale. My thoughts are that we shouldn't think of any intervention as something that is universally needed - we should target it to systems where demand for the intervention exist, and also where other 'success factors' apply (e.g. favourable policy and institutional environment, or ability to create these). My feeling is that recording and feedback schemes currently have higher demand in the intensifying systems compared to other systems, as in the intensifying systems their is more emphasis on keeping livestock for household income purposes, as well as market orientation. I mentioned earlier in the forum mobile phone based recording and feedback schemes we (ILRI) are testing, based on the premise that information provided back to the farmer that assists them with farm management decisions will provide the ongoing incentive for farmers to record. This model, however, is still being tested. I would be interested to hear from others their thoughts on this important topic. So I see potential use of genomics in parent verification in future and hence less need to accurate pedigree recording and traceability (already mentioned in the discussion). In a current study, one of our students has discovered same dairy sires have been used in Kenya, South Africa and Zimbabwe. The genotyping of such sires used across several countries offer a great potential for an across country genomic evaluation resulting in more accurate team of young bulls. Genomics will offer opportunity to identify genome regions associated with various adaptive features in many indigenous African breeds and how these could be used in practical breeding program either using genomic selection plus gene editing or some sorted of modified marker-assisted selection. Thanks Raphael for this update of the Dairy Genetics East Africa project, as well as your thoughts on how this could expand in the future. Their is often discussion on what is the minimum size of a reference population needed for genomic selection in African systems, such as smallhold systems (where their is often a lot of environmental noise and thus lower trait heritabilities compared to intensified systems). What are your recommendations here. Also, how did you handle the presumably small contemporary group size in this analysis? And on parentage testing - many people who have completed the survey indicated that they felt this was in demand from stakeholders. Are there examples of livestock parentage testing in African systems, and if so for what purpose .... or how do you see this being beneficial (or not). Several people have mentioned using genomic approaches to determine breed composition of animals (where it cannot be assigned based on phenotype, or due to lack of recorded pedigree). Are their other examples of people using this in their research, or who would find this beneficial in relation to future research? And what about industry application? Yes Karen there is great need of making sure breed composition determination, livestock traceability, and pathogen detection are in place within our livestock production systems. This is because our livestock products are banned from entering overseas markets simply they lack these information and we therefore fail to fully exploit the international markets in most of the developed countries. Thanks - do you know of any countries actively working on traceability? Currently l have not come across with any African country with animal traceability programme which is in place working. For instance in Tanzania we have animal traceability policy but it is not yet practically well implemented and this is the problem of most of the African countries facing at the moment. Botswana, Namibia and Swaziland which export beef to the EU have functional traceability systems in place. The Botswana system reliant on the use of ruminal RIF bolus ran into operational challenges and they adapted it by adopting the Namibian system based on the ear tag (http://www.gov.bw/en/Ministries--Authorities/Ministries/MinistryofAgriculture-MOA/Tools--Services/Livestock/Livestock-Identification-and-Traceability/?p_id=3191). Thanks for the update Baitsi. Do you see any demand for tracing of livestock products (where genomics could play a role) versus tracing animals (where ear-tags seem more cost-effective)? I only know of the two reports commissioned by AU-IBAR which myself and others helped in validating (TCP/RAF/3403 FAO/AU-IBAR) on animal genetic resources management in Central and West Africa (1. 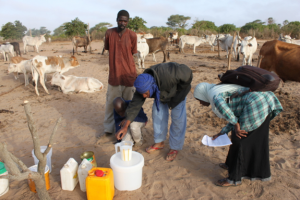 Support to pastoralism for the management and use of AnGRs in West and Central Africa and 2. Livestock identification and recording in Central and West Africa and impact on regional trade). I concur with the submission of Kabuni. If we have to make the best use of our natural endowment, then every aspect of livestock breed composition, production, improvement, traceability, health and marketing must be put into consideration. On the question "Which genomic or genetic applications have the most potential to positively impact on the rural poor in Africa – in the near future and the longer term" we have had a number of responses in relation to genomic selection, including the varied constraints associated with implementation of such a scheme. But what about other genomic applications (determination of breed composition, livestock product traceability, pathogen detection etc.) - do you see future demand for these in African (or other developing) livestock systems? I believe the biggest impact of genomics will be on performance improvement through geneomic selection. The present constraints should be addressed rather than be seen as obstacles to attainement of breed improvement through genomics. I say this because Genomics offer us the tools for a more precise breed improvement which is essential to maintain the balance between performance and adaptability of the indigenous breed use by most rural poor farmers.